Software is eating the world. And products that we know in the past as purely mechanical, today have strong dependencies on software embedded or used with these products. From that standpoint cars are literally becoming a “computer on wheels”. The way we control car and many related car features are completely dependent on software run inside the car. As a result of this shift, to manage software is now one of the highest priorities for car manufacturers. Car can be malfunctioned only because of the wrong software, car can be hacked using software and car can be improved significantly just by using software updates. The problem is recognized by PLM vendors. Product Lifecycle Management started as pure mechanical and later electro-mechanical based discipline now turning into a multi-disciplinary mix of mechanical, electronic and software components. Siemens PLM is planning big to integrated software into PLM products and platforms. The acquisition of Polarion in 2015 was part of Siemens’ plan to deliver an integrated PLM + ALM product to customer. Recent Siemens PLM announcement of Integrated Software Engineering Solution for automotive is the outcome of the acquisition. Read more here. Managing embedded software development in close synchronization with the development of physical systems is a big challenge for automotive companies. Due to its nature, product engineering and software engineering follow inherently different development lifecycles. Software development is managed separately, and interface validation with hardware is done only during pre-defined checkpoints. 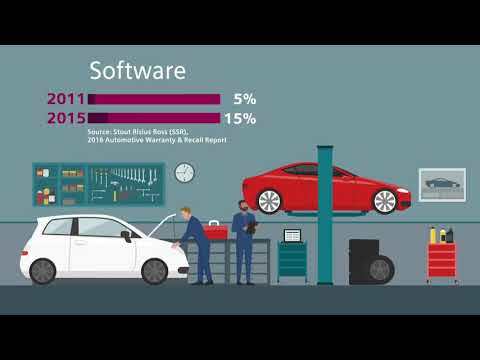 In an era of smart-connected cars, the interactions between software and physical systems are increasingly becoming more complex exposing deficiencies of current processes, tools and methods. A Digital Twin of vehicle systems capable of representing the complete physical and digital behavior of today’s IoT connected cars is necessary to realize innovations. It made me think about growing complexity of data management to support integrated development processes. PLM and ALM are very much separate products. Even you can make the technology to synchronize them better, the biggest challenge will be staying there – people and teams working independently on hardware, electronic and software. What will be the next challenge for integrated PLM+ALM software? In my view, to organize collaborative processes to bring multi-disciplinary distributed engineering teams to work together is one of the biggest challenges PLM+ALM will experience next. The core backbone of data integration for these teams is product structure or Bill of Materials. This data structure supports an existence of so much hyped term “digital twin”. Without ability to integrate them together and to allow engineers to work on an entire structure and dependencies, synchronization of data between PLM and ALM can be dead on arrival. PTC bought MKS in 2011 for exactly the same purpose: integrate PLM with ALM. The whole area went pretty quiet with PTC’s shift to IoT though. I wonder if you have some insider insight into that endeavor, Oleg? Erich, I guess it was way too earlier. IMO, nobody was really focused on how to combine software and engineering BOMs back those days except of very sophisticated defense, aero, auto.